Alright, with a year that sees Gen X'ers losing celebrity icons from their youth in near epidemic proportions, it sure is nice to have movies. Yes, some consider them just mere entertainment, but in their immortal form (which gets better and better every year due to 4K, 5K, and whatever other K somebody wants to transfer them to), these things will honestly never go away. They will live forever. When you realize that we have lost Lemmy, David Bowie, Glenn Fry, Vanity and lord knows who's next, the realization of our own mortality has never been more profound. Which is why the amount of movies turning 30 in 2016 is so crucial. Yes, we at MovieWeb write a lot of lists. Why is this? Well, aside from the fact that you like lists, they serve a purpose. People inherently want to know that other people agree with them. The fact that this validation comes from somebody they don't know makes it all the better. However, movie lists that put into perspective how long we've been on this earth are darn near priceless. I say that because almost everybody likes movies. Because of this, we are able to look back at our lives and see them in terms of celluloid. Often, we recall pivotal moments around when we saw a certain movie, or, we liken said moments to something that would happen in a seminal film. It also doesn't hurt that the 1980s are back. When not racking my brain to come up with interesting stories for MovieWeb, I work in a high school. The students there LOVE the 1980s. They love the pop culture from that time. Even the current music they listen to is highly informed by the classic music of the 80s. In fact, in writing this list I was given pause many times. I remember where I was, what I was doing, even what I was thinking when I saw these films. The fact that I can recall memories from 30 years without missing a beat, but I now walk into rooms and forget why I did so, makes me realize, like the films on this list, I am old. Honestly, I don't mind getting old because putting together a 30 Movies Turning 30 in 2016 list makes me realize, I have been around for some of the coolest, funniest and transforming times in cinema. Now, if I can just be around to write "30 Movies Turning 90 in 2106". 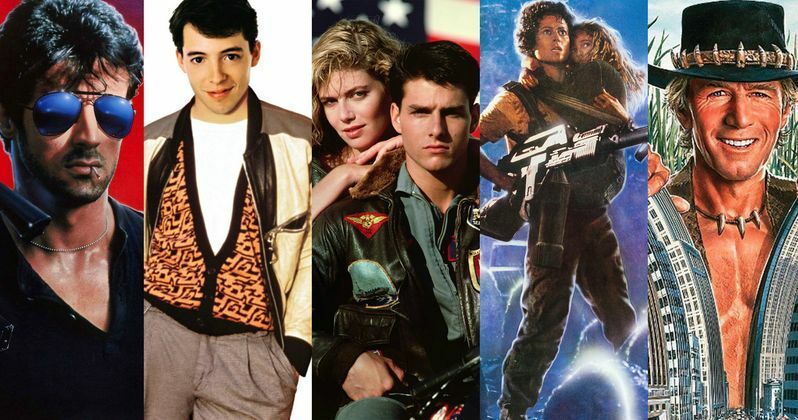 Here are some of the best and most beloved movies celebrating their 30th Anniversary over the course of the next 12 months. After floating in space for 57 years, Lt. Ripley's (Sigourney Weaver) shuttle is found by a deep space salvage team. Upon arriving at LV-426, the marines find only one survivor, a nine year old girl named Newt. But even these battle-hardened marines with all the latest weaponry are no match for the hundreds of aliens that have invaded the colony. Yes, James Cameron's groundbreaking, sci-fi epic is hitting the big 3-0! And the good news is that the FX in this film still hold up. The story is just as solid as ever. Even more important? The character of Private Vasquez now seems even more prescient given how much our military has changed. The Top Gun Naval Fighter Weapons School is where the best of the best train to refine their elite flying skills. When hotshot fighter pilot Maverick is sent to the school, his reckless attitude and cocky demeanor put him at odds with the other pilots, especially the cool and collected Iceman. But Maverick isn't only competing to be the top fighter pilot, he's also fighting for the attention of his beautiful flight instructor, Charlotte Blackwood. Alright, this one hurts a little bit. It literally seems like yesterday that I was watching jets fly across the screen, buff dudes play volleyball, and witnessing the shocking death of Goose. This film may be 30 years old but it honestly feels like only 10. Ferris Bueller has an uncanny skill at cutting classes and getting away with it. Intending to make one last duck-out before graduation, Ferris calls in sick, "borrows" a Ferrari, and embarks on a one-day journey through the streets of Chicago. On Ferris' trail is high school principal Rooney, determined to catch him in the act. Well, it seems like the Peter Pan of the 1980s has finally seen father time catch up with them. This isn't to say that this fun romp, that at times turns darkly serious (which is what makes the John Hughes films of the 1980s so great of course), is showing its age. Rather, it has more to do with the fact of what Ferris Bueller represents to myself and fellow Gen-X'ers. We age, my faithful readers, but that doesn't mean we have to get old. Ferris Bueller taught me that. Kurt Russell plays hard-boiled truck driver Jack Burton, who gets caught in a bizarre conflict within, and underneath, San Francisco's Chinatown. An ancient Chinese prince and Chinatown crime lord has kidnapped a beautiful green-eyed woman, who is the fiancee to Jack's best friend. Jack must help his friend rescue the girl before the evil Lo Pan uses her to break the ancient curse that keeps him a fleshless and immortal spirit. This quirky tale from multi-genre master is timeless. Sure, the dates may say that this movie is 30, but there is nothing old, or dated about it! This explosive tale of Jack Burton (who might be a more bumbling hero than Luke Skywalker), sees himself pulled into a long standing war in Chinatown. Everything about this movie shouldn't work and that is why we recall it 30 years later. College student Jeffrey Beaumont returns home after his father has a stroke. When he discovers a severed ear in an abandoned field, Beaumont teams up with detective's daughter Sandy Williams to solve the mystery. They believe beautiful lounge singer Dorothy Vallens may be connected with the case, and Beaumont finds himself becoming drawn into her dark, twisted world, where he encounters sexually depraved psychopath Frank Booth. David Lynch's best film turns 30 and holds up even better now. Why? Could it be the amazing performances? The twisted (yet, accessible) storyline? Or, the fact that 1950s look even more messed up with a 66 year old lens pointed to it. Andie is an outcast at her Chicago high school, hanging out either with her older boss, who owns the record store where she works, or her quirky classmate Duckie, who has a crush on her. When one of the rich and popular kids at school, Blane, asks Andie out, it seems too good to be true. As Andie starts falling for Blane, she begins to realizes that dating someone from a different social sphere is not easy. Yet another John Hughes movie and that fact (and this film being on this list) should surprise nobody. This tale of high school love is timeless. Part Romeo and Juliet, part La Traviata, all 80s... Pretty In Pink, at 30, has never looked or sounded better! After learning that a stranger has been accidentally killed near their rural homes, four Oregon boys decide to go see the body. On the way, Gordie Lachance, Vern Tessio, Chris Chambers and Teddy Duchamp encounter a mean junk man and a marsh full of leeches, as they also learn more about one another and their very different home lives. Just a lark at first, the boys' adventure evolves into a defining event in their lives. Isn't it incredible how many great films, how many true coming of age tales came out in 1986? This story of 4 friends going to see a dead body is so much more than that. Watching this film is a rite of passage that needs to be handed down from generation to generation so people are talking about it 100 years from now. When scientist Seth Brundle completes his teleportation device, he decides to test its abilities on himself. Unbeknownst to him, a housefly slips in during the process, leading to a merger of man and insect. Initially, Brundle appears to have undergone a successful teleportation, but the fly's cells begin to take over his body. As he becomes increasingly fly-like, Brundle's girlfriend is horrified as the person she once loved deteriorates into a monster. Remember how awesome this movie was? Like all great films, there's a lot of excitement when our mad scientist tests out his teleportation machine on himself. However, things go south very quickly and once he starts losing body parts and having to throw up on all his meals, that is just about the end of the joyride. Director David Cronenberg crafted one of the seminal scientific cautionary tales of the 1980s, and it is great to see it has aged so well. Chris Taylor leaves his university studies to enlist in combat duty in Vietnam in 1967. Once he's on the ground in the middle of battle, his idealism fades. Infighting in his unit between Staff Sergeant Barnes, who believes nearby villagers are harboring Viet Cong soldiers, and Sergeant Elias, who has a more sympathetic view of the locals, ends up pitting the soldiers against each other as well as against the enemy. I recently watched this movie with some friends. They said it didn't hold up, I told them that it had never been better. This Vietnam story is your classic tale about the many casualties of war. That it still feels relevant to our geopolitical situation is even more incredible. My friends don't know what they're talking about.